Update – Today Microsoft had confirmed the launch the official launch date of the upcoming Lumia 950 and Lumia 950XL. While at the Future Unveiled conference, Satya Nadella, CEO of Microsoft had confirmed the launch of Lumia 950 and Lumia 950XL in December, but now the company had scheduled the launch event on November 30th. 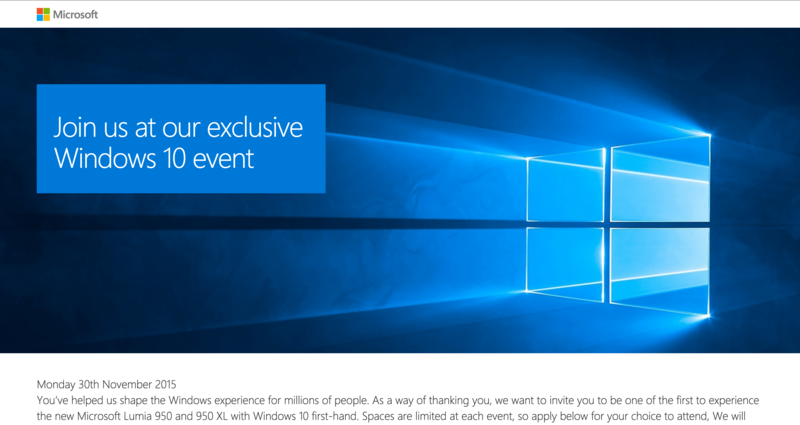 The Windows Insider event will be also held on the same date in New Delhi and Mumbai giving the first hands-on experience for the Windows Insiders. The company had also announced the launch date for the UK as December 2nd where the event will be held in Manchester and London. The pricing of both the devices are still unknown, and there is no confirmation about the inclusion of Continuum dock with the package. In few countries, the company had provided Continuum dock for free with every purchase of Lumia 950 and 950XL. We expect the company21 to launch both the Single SIM and the Dua SIM variants of the Lumia 950 and 950XL in the India. Earlier: Nov 5, 2015 – Microsoft India has silently announced that their 2016 Flagship Smartphones Lumia 950 & Lumia 950XL are coming in India in the month of December 2015. This is a month before they are going to launch the Surface Pro 4 that’s going to be launched in the first quarter of 2016. Both these devices feature the same 20-megapixel rear PureView camera with triple-LED RGB flash modules and a wide-angle 5-megapixel shooter placed upfront, and a fifth generation OIS (Optical Image Stabilization). We have no price information yet since this is just an announcement for the launch plans from Microsoft at the Future Unleased event.